There was a day when keywords were very useful in helping people craft content but I believe that day has been dying for several years now. Think about life as a search user for a minute: Have you ever searched for something and found results peppered with things that were not related to what you were searching? Have you ever clicked a result to find keyword-rich content that was really not what you wanted or was no fun to read at all? I have. Keywords make generating high ranking content with low relevance easy. Yet the best UX (user experience) comes from finding pages written by people who are A) good writers and B) experts in the topic. These pages are typically naturally rich in keywords because their generation is not driven by what people are searching, but rather, by what should be written. It‘s an important distinction; content written because people search a word or phrase vs. content written because it is important, valuable and interesting. I prefer my search results to return the latter. If you are a low quality content provider, or if you are lazy or not very good at what you do, loss of keyword data will be crushing. But you are reading this; ergo you are not lazy, you are good at what you do, and you are determined to be even better tomorrow. Content providers who wish to compete think like content consumers. If Google‘s goal is to make money through search (and it is) then the ideal scenario for Google is to give web search users the best search experience—connecting them to the best that the web has to offer—and thereby preserve and grow Google‘s share of search users. If your root goal aligns with Google‘s ideal scenario and you execute on delivering the best UX possible from content and design to social and whatever is important to users tomorrow, then Google and other search providers will reward your site by suggesting it to search users. Like so many others, I started using Google for two reasons: 1) a clean interface 2) more relevant search results. The latter is why I kept using Google. When I search I am looking for my own great UX. I demand that my search engine of choice deliver on the promises of delivering the most relevant content with best UX. Google has this figured out. Google is working hard to ensure that they are the best at delivering great content on great sites; they understand that this is the only way for Google to remain relevant to the user. And, again, the web evolves to make UX better. So exactly how is this opportunity? When I was a competitive road cyclist I loved racing in the rain. Sure, it‘s harder; it‘s often cold; it is always dangerous; it demoralizes the field. And THAT is the makings of a competitive advantage. Loss of keyword data makes it harder on websites competing for my search user. Common tools and passed-along know how to take market from my sites is going away—it‘s back to intelligence, foresight, savvy marketing, and good old fashioned hard work. Since I am doing something that is real I will win the content game. That excites me. Practical notions: Keywords can help you understand your demographic and there are still ways to get keyword data but it is important to understand that the demographics for Adwords or for other search engines who, at least for now, still offer us that data, is different from the Google search user. Historical data reflects this easily: when you look at keywords across various search engines you will find that on any given keyword the per capita search volume varies. You can still use what is available to aid crafting great content...just don‘t expect that artificially keyword rich content will not eventually be punished (see ‘The Future of SEO’ about Google‘s AI machine). Also it is possible to glean a notion of keyword data from careful use of other tools. In this new world the tough will not only survive; they will thrive. Ultimately it‘s not about the keywords. It‘s not about what you can measure. It comes down to being relevant to your user and being something that is more than marketing-speak. Ultimately it comes down to being real. If you are willing to do the work of being real, interesting, and relevant, then the search engines will beat a path to your door. 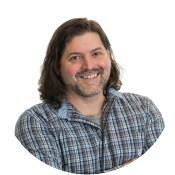 Daniel Westcott is a Search Engine Marketing Developer for Simpleview with more than 20 years of agency experience. For questions regarding this post, visit our ‘What We Do’ page to learn more about our SEM services.